Enagic Reviews: We Have Found that Kangen Machines are Good but Not the Best Water Ionizers. It is because of our extensive testing of the Kangen SD501 water ionizers [otherwise known as Kangen Water] that we don't regard them as the best. We tested Enagic Kangen alkaline water machine against pretty much all of the other good water ionizers and you may have seen many of our articles about Kangen water over the years on our blog. We do feel that the Kangen alkaline water machine is one of the best water ionizers, though. For instance their flow-rate is very fast. The Kangen machine can produce several extra gallons of ionized water per day [more than most other countertop water ionizers]. See this page for more Enagic Water Ionizer Reviews. Over ten years ago we started testing the kangen ionized water. Like many other water ionizers, people drinking Kangen water are experiencing great health benefits. These benefits, despite being touted as exclusive to Enagic water ionizers at Kangen meetings, are not exclusive at all to Enagic sd501 Kangen water machines. I have been drinking ionized water and experiencing tons of health benefits for too long to be fooled by any idea of exclusivity when it comes to health claims in particular by MLM representatives. 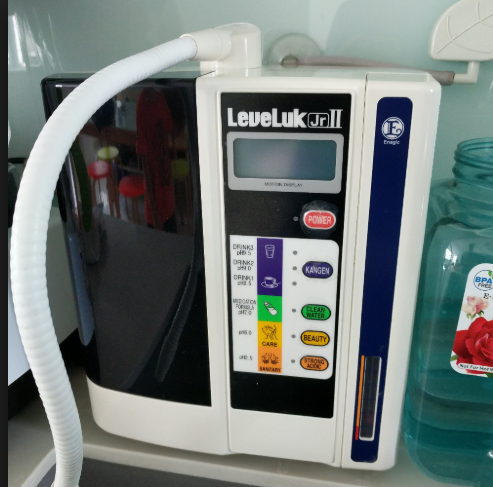 At Alkaline Water Plus, we test many water ionizers against each other in many different ways and locations including the Enagic Kangen SD501. We have found many brands of water ionizers that we didn't feel tested well enough to sell and many others that we like and do sell. We have always focused more of our testing on drinking levels of ionized water than any other category. We consider that the most important feature to compare from water ionizer to water ionizer is the quality of ionized water (pH/ORP [antioxidant] levels and filtration quality) in the drinking water. It is this quality of drinking levels of ionized water (kangen ionized water) that we believe the Enagic (Kangen Water) water ionizers are good, but not the best. See more on our Water Ionizer Comparisons page. Enagic water ionizers' head US office has determined that no one may represent Kangen Water if they also sell other brands of water ionizers. This is the main reason why Alkaline Water Plus does not sell Kangen water machines. Because we don't think they are particularly the best water ionizers, we of course could not exclusively sell only the kangen machine. Why Do I Say Kangen Water Machines Aren't the Best? Here are two videos to some testing of 1) the Kangen Water (Enagic) water ionizer and 2) the Nexus Smart 7P water ionizer. The first video is one done by a Kangen dealer. I'm sharing this video here to show that 1) Kangen water does contain molecular hydrogen antioxidants, and 2) this video shows that it can produce about 2 ppm (parts per million) of hydrogen antioxidants at Kangen Water 9.5. This next video shows the Nexus Smart 7P water ionizer (about 2 minutes into the video until about the 5-minute-mark) shows that it gets about 1.5 ppm of molecular hydrogen. This is considerably higher than the Enagic machine. The Nexus Smart 7P water ionizer has 1) better filtration, 2) a better warranty and 3) a fantastically better price than the Kangen machine.